Cristina at Remodelando la Casa did a fabulous job on her kitchen a few years ago. So did you figure out what the ONE common denominator of these kitchens is? I'll share more info about our kitchen makeover project soon! 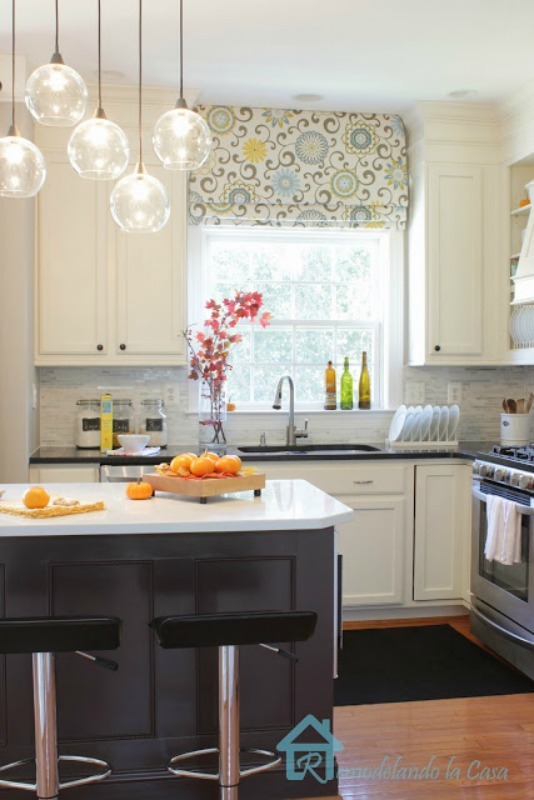 Are your getting a new backsplash? Great kitchens btw! I have pinned on of those myself. No, it's not the backsplash. Each one of these backsplashes are different. Your post today could have come from me! I'm about to do the same thing in my kitchen. Can't wait. Are you going to repaint your cabinets as well? If so, what color are you choosing? That's the thing that's holding me up most — I can't decide on a color. I don't want white and I don't want any yellow in the off-white. The boxing in on top of the cabinets begins on Monday. Yay! Enjoy your new project — I know it will be beautiful!! Lucky you that yours begins Monday. Our carpenter came out a week ago, but has not said when he will begin. Soon I hope. I know he is on another job right now so I will be patient. Yes, will go white on the glazed cabinets side. There is no way I could match up the glazing that was done professionally and I'm not paying to have them painted again. That's not the common denominator here, but I will have that, too on some of them. Not just that. One of these photos doesn't show white anyway. Kim - is it the crown molding on top of the cabinets? White cabinets....surprise! Better you thsn me, I think that they are sterile and show any little splash or scuff! I like warmth in the home and white doesn't encourage that feeling to me, to me white is snow, but I'm from Michigan. If you will look all these inspiration photos do not have white cabinets even though that will be happening on one side of my kitchen. Sorry, I like white and it's not hard to clean. Looks like there is wood only on two ceilings. This will be a small scale project. We already have an island and already have wood floors. You did get the cabinets right. No, marble countertops in all these pics. How exciting Kim! Recessed lighting? Kim, is it a new cabinet range hood? 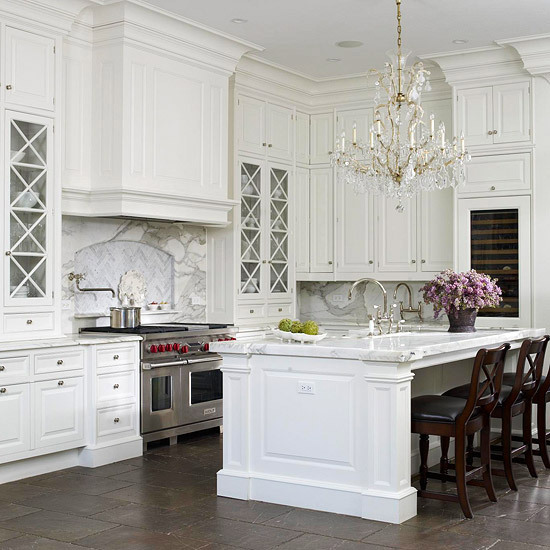 I would love to have a beautiful mantel-like range hood to decorate! All of these photos are lovely examples. No, already have a hood and that isn't a common denominator in these pics. The thick crown molding really stands out to me, too. I was going to say cabinets to the ceiling, but on closer inspection, the cabinets in the first shot don't appear to go all the way up. Some of them seem to have large hoods above the stoves, but at least one doesn't show a stove at all. And they seem to have wood floors...except for the last one. This is like Where's Waldo! Yes, they do go all the way. I think the darker color ceiling makes it look like they don't. We already have wood flooring. Already have a hood, too. The one common denominator I see is substantial crown molding. You mentioned a carpenter. . .do you have someone adding molding? Whatever you do, it will be wonderful! All the cabinets go to the ceiling. If that is indeed the common denominator--go for it. We just completed a total kitchen makeover and went with warm white cabinets that go all the way to the ceiling. I am only 5'2" and cannot reach them, but that doesn't matter one bit to me. I LOVE them!! Our actual cabinets will not change, but the top of them will. 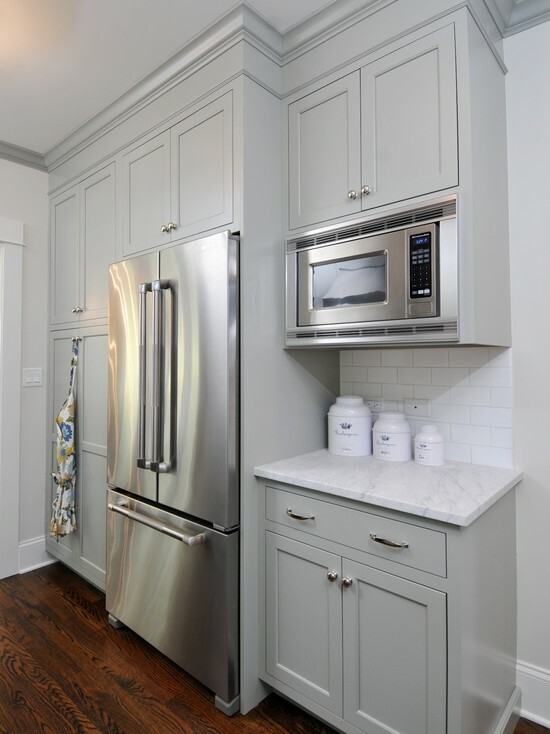 Ceiling height cabinets with chunky crown molding, painted white, and all the door fronts are the same with the boxed look. Love it. Good guess except our door fronts won't change since they were replaced several years ago. Whatever you do - it's going to be awesome!! It looks like molding was added to take the cabinets to the ceiling, sometimes in the form of a flat piece and then the curved molding. I think that's really smart and I probably should have done that in mine. They also all have recessed lighting, although you can really see that for sure in the second picture. Have fun with it, whatever you do! Your kitchen turned out wonderful, Lory. i would have said bringing the cabinets to the ceiling? 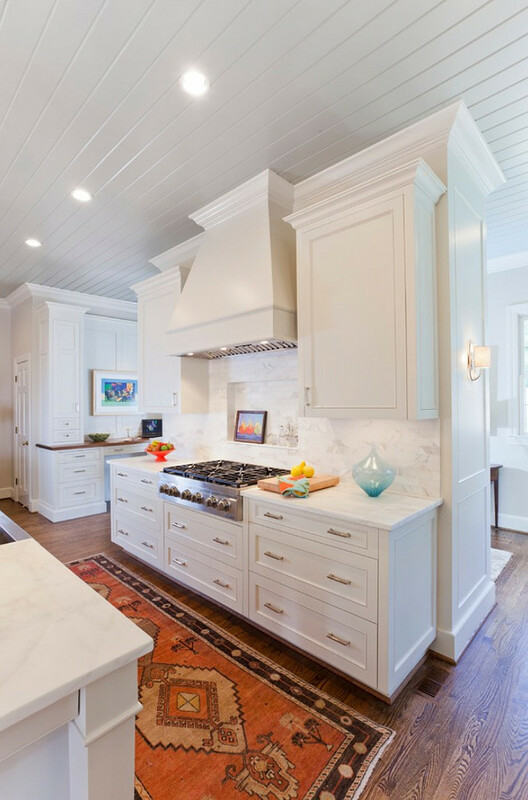 Are you having the soffits closed in and possibly adding an island that's bigger than the butcher block and maybe adding another cabinet somewhere? Janet, I am so glad my husband is on board with this. Instead of downsizing which is what I really want to do he wants to stay put and fix things that aren't quite right. Hmm, I have a soffit that I have been wanting to take down forever. Your ideas have given me an idea, to add some decorative molding to it and leave it alone??!! You are so smart, Marty. Holy Cow Kim!!! I just went to look at your kitchen pins. Girl - you do some serious pinning! You must be burning the midnight oil LOL. I have been pinning for years. 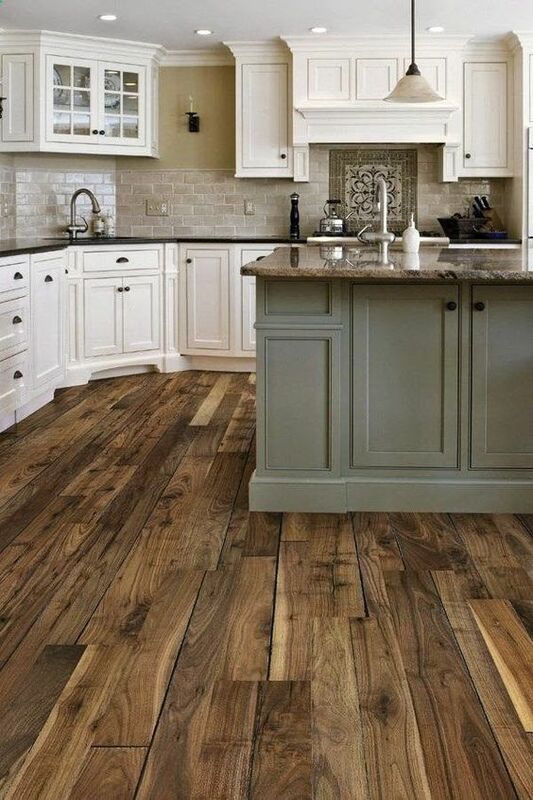 Extending your wood flooring in to the kitchen? How exciting! :) We have wood in ours now and so far so good though I am still paranoid about it as to oppose tile. It just makes the space feel so much larger. Can not wait to hear all about your makeover! We already have wood floors in our kitchen. We have had no issues with it and have had it probably 15 years. 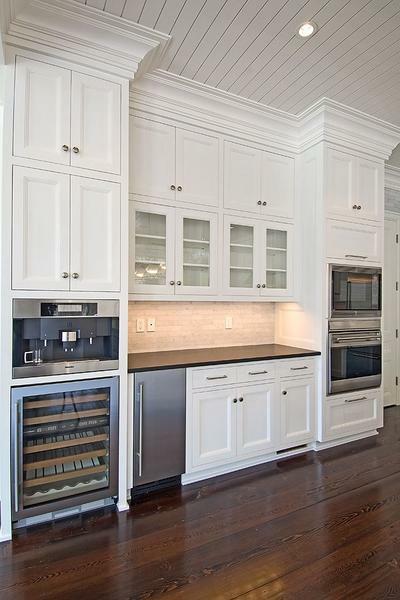 The common denominator is that the cabinets go all the way to the ceiling! I thought it was the crown molding but see that it is alaso they will go to the ceiling. Looking forward to seeing that! Is it the Shaker style cabinets Kim? I love that style, especially in white. Can't wait to see what you have planned! I'm sure it will be beautiful. Doors are not changing. We just changed them in the last remodel. cabinets that go to the ceiling or at least a fill in so that you don't have space to fill on top of the cabinets. I spotted that theme right away. I also have that in my kitchen.